In our coastal town we eat a lot of wonderful seafood. Crab cakes are such a delicacy that pair well with a good steak, a piece of grilled fish, over a bed of orzo, or on top of a colorful summer salad. 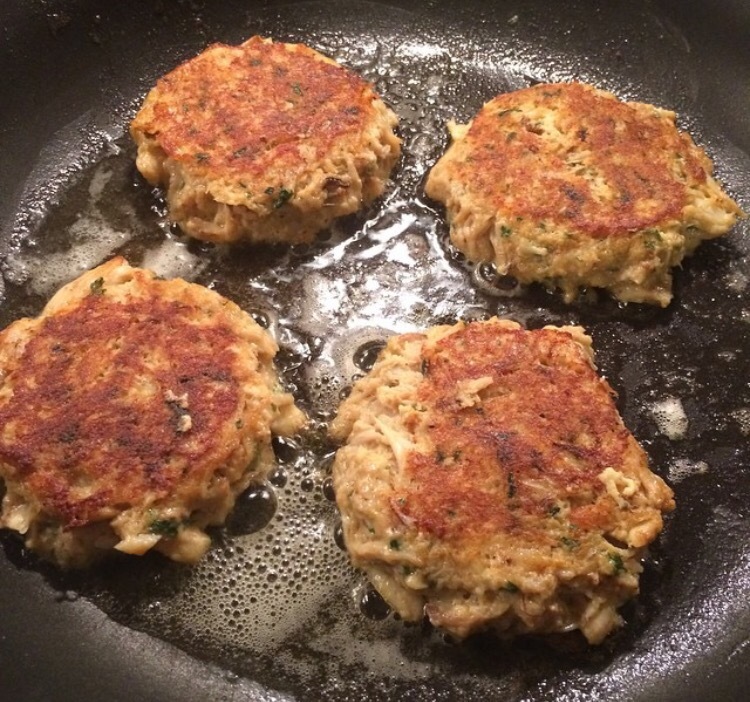 My ideal crab cake is light, flavorful, and has the slightest amount of bread that I can get away with….basically just enough to bind it together. Begin by putting 2 slices of good white bread (crusts removed) in your food processor and pulse until it becomes fine. Combine: Bread crumbs, 2 tablespoons mayo, 1 egg (beaten), 1 teaspoon Old Bay, 1 teaspoon Dijon, 1 teaspoon Worcestershire, 1 tablespoon dried parsley, and 2 teaspoons lemon juice. Fold in 1 pound lump crab meat. Cover and refrigerate for at least 1 hour. Remove and form into patties.